You generally hear Finian McGrath before you see him. His bellowing laugh can be heard bouncing off the walls as he makes his way through Government Buildings, exchanging greetings with everyone he meets. Before he entered his ministerial office last Thursday afternoon, he laughed and told Junior Minister Kevin ‘Boxer’ Moran to “stop plamasing” as he agreed to attend the launch of a Government initiative. He rummaged around in his briefcase before the interview began and produced a list of projects and investments he secured during his three years in office. It included €11m for a new cystic fibrosis unit in Beaumont Hospital, €5.95m for a new kidney unit, €167m for HSE disability services, €10m for extending medical cards to 10,000 children and €10m for respite care. The list goes on. The same one-page document was distributed to Independent Alliance councillors who attended a dinner event the previous night in Leinster House. There were 22 of them, believe it or not. McGrath said the group will field 30 candidates in the local elections. “The message we’re sending out is basically we’re saying, listen, if we could get four or five of you guys elected on top of us [in a general election], that would be eight or nine and that would be a substantial block for the next Government,” he said. However, he was not convinced the Dail will be stripped of Independent voices when the country next votes. He said the Alliance showed they were “radical but responsible” in entering Government with Fine Gael. He said “deep down”, Fianna Fail and Fine Gael know they will have to rely on Independents to form the next Government. “And that, on the last week or two of a campaign, could push us up another bit because you’re relevant to the debate,” he added. Would he have an ideological objection to doing business with either Sinn Fein leader Mary Lou McDonald or Fianna Fail leader Micheal Martin? “No, I’d do a deal with the devil,” he said, before breaking into laughter and adding: “there’s your headline”. “You see, historically, I’m the only Independent TD that’s done a deal with four different taoisigh – I did a deal with Bertie, I did a deal with Brian Cowen, I served in Government with Enda Kenny and I served in Government with Leo,” he added. He said the current Taoiseach knows his red lines – disability funding and additional services at Beaumont Hospital – and he insisted that if he’s “doubled crossed” by Leo Varadkar, he will walk away without any discussion. He would prefer if the general election was next year but believed it will probably be this coming autumn. He’d be happy to remain Disability Minister in the next Cabinet but was also open to the Health and Social Protection portfolios. On the housing crisis, he said builders have told him privately they were not building domestic homes because there was more money to be made working on state capital projects because they were “much easier, they’re less hassle and there’s more profit”. At a Cabinet meeting last year, he accused Fine Gael ministers of “looking down their noses” at social housing but, while refusing to comment on the confidential discussion, he said the party’s “mindset has changed over the last year”. He insisted Fine Gael was not spinning homeless figures and there was a “constant flow” of people coming into his constituency office looking for housing. McGrath said, “people are afraid to say it” but he insisted some people were “gaming the system” by claiming homelessness to be bumped up the housing list. “I’m not saying it’s a huge issue, but it’s there as an issue and it’s unfair to those who are waiting around for five, six or seven years,” he said. McGrath said working couples are even asking him, should they go on the social housing list because they can’t find accommodation? “I have working couples coming into my clinics and they’re talking about going on the social housing list – we have to accommodate them and let them go for their house so it takes the pressure off the social housing list. “They want to buy, they have a low salary, a combined salary of €60k let’s say, that’s the situation, those people should be facilitated,” he said. The minister believed that there should be more “flexibility” around the Central Bank mortgage rules to allow more first-time buyers to get on the property ladder. McGrath was supportive of his Fine Gael Government colleagues – Housing Minister Eoghan Murphy and Health Minister Simon Harris who, he said, were doing “their best in a bad situation”. However, he was furious with Fine Gael ministers and TDs who were using Transport Minister Shane Ross as a “fall guy” for concerns raised by people living in rural Ireland. “Government ministers and backbenchers should cop on to themselves. It’s a collective group of Independents and Fine Gael in Government and it’s not one person who’s responsible for the problems in rural Ireland. I think that he’s a very easy fall guy and I think that Shane is being used by some of them as a battering-ram and I don’t like that. “I think it’s very unfair and it’s been spun by some within our own Government and also some of the Opposition party, so I don’t think it’s fair and we’re doing our best for rural Ireland,” he added. 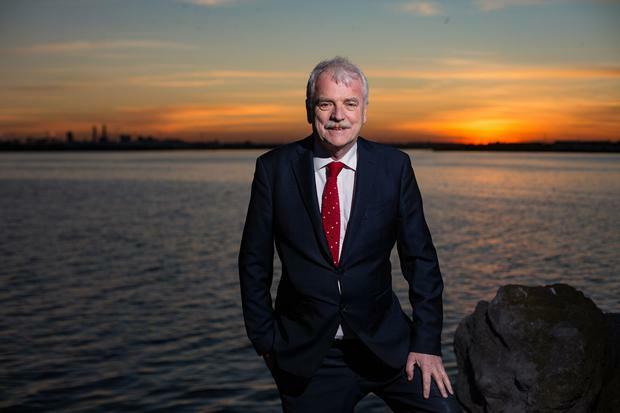 McGrath believed the Government had to “bite the bullet” and push through Ross’s laws on drink-driving and unaccompanied learner drivers despite resistance in some parts of the country. However, the minister also believed Garda enforcement of the new legislation had been “really over the top” and made the extraordinary claim – in comments he has since withdrawn – that there was a political agenda among some members of the force who were unhappy with the road safety laws. “I’m getting complaints around the country that they are breathalysing people at 2pm in the day. To me, the breathalysing time should be at pub closing time between 12 o’clock and 2 in the morning. That’s where the focus should be so I don’t know what agenda is going on there,” he said. Does he think some gardai are opposed to the new laws? He claimed gardai are specifically telling motorists that Shane Ross was to blame for roadside check points. “I would like Drew Harris now, as part of the reforms we have, to de-politicise anything like that in a police force. A police force – like teachers, nurses – guards should always be non-political. That would not be tolerated in any other profession,” he said. He insisted progress was being made on a Programme for Government commitment to recognise the state of Palestine despite international resistance. “It should be going quicker and I think we will see movement in the next couple of weeks,” he said. It came after a slap-down from justice minister Charlie Flanagan, who labelled Mr McGrath’s remarks as “bizarre”, “unwise” and “even dangerous”. Mr McGrath, an Independent Alliance junior minister released a statement saying he is withdrawing his comments which he made in an interview with the Sunday Independent. He said: “Nobody is more supportive of the work An Garda Siochana does – often in tough circumstances- than I am. “My comments in this morning’s Sunday Independent were prompted by concerns raised with me over the past number of weeks. “I acknowledge that these concerns were wrong and I am happy to withdraw my comments. The 65-year-old minister, who was just back from a State visit to Mexico and Cuba, said he had no intention of quitting politics any time soon. “I could retire, yeah. But I love the day job. I’d be delighted to be here at 70. I love my day job, I love being a minister. I will stay in the job as long as I get that buzz,” he concluded.